Putting their young talent to the test Australian riders Jayden Brown, Hayley Beresford and Jessica Greelish have come a long way to make it the 2013 World Championships for Young Dressage Horses in Verden, Germany and were proud to represent their island-home amongst the best in the world. "Verden has been a fantastic show with a really positive atmosphere," say Jayden, who is only the third Australian ever to ride their horse into the final round of the World Championships. Maree Tomkinson (on Diamantina) and Mary Hanna (on Rituel) preceeded Brown's brilliant achievement. Claiming 16th spot from 40 starters in the preliminary round, Jayden's 6 year-old San Andreas is a Hanoverian by Sandro Hit x Walt Disney moved on to finish third in the consolation finals and claim that coveted Finals' tickter after all. With a 7.36 score, the duo ranked 14th in the 6-year old Finals. Jayden was "absolutely thrilled" with his performance in a tough field. "I was particularly happy as this was my first time competing in Verden at the Young Horse Championships, besides having ridden once as a warm-up rider for the judges on my horse, Furst Friedrich," Brown told Eurodressage. While he has worked in Germany in the past, Jayden now trains back in Australia where he has established his own business. The distance to Verden definitely presented a special hurdle for both horse and rider. "I have had quite limited preparation with San Andreas. He left my stable after the Sydney CDI at the beginning of May and spent 4 weeks in quarantine. Unfortunately the flight really wore him out so he had very light work once he arrived in Germany," said Brown. German trainer Hubertus Hufendiek has been keeping the horse in shape and Brown only arrived one week before Verden to pick up the reins again. "With my own business commitments and other horses in Brisbane, I couldn't get here any sooner but given our preparation and San Andreas' fitness and strength, I think he performed his absolute best," he explained. Trained in Brisbane by Traci Manca, Jayden also receives regular coaching from Leonie Bramall and Annemieke Vincourt, who visit from Europe for training clinics. "Brisbane is home for me. 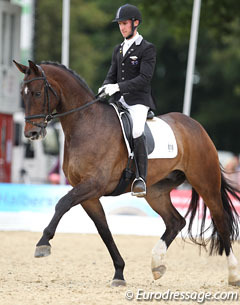 However the main difficulty this presents for me is travelling to compete because of the lack of time with the horse. Fortunately I have a very solid foundation with San Andreas and I know his personality well enough to pick up where we left off," he said. Inspired by any rider who is humble enough to improve their skills, take time to help others and really anyone who can work hard to earn their way to the top, Jayden plans to do just that and continue to expand his business in Australia. "In 2013 I hope to focus on developing my young Grand Prix horse and put a little more focus into some of my talented younger horses to begin their FEI careers." Having only been with the talented 5-year old for a short time, Hayley Beresford was pleased with the results her Hanoverian mare Rebana W (by Rosario x Ravallo) produced at such an early stage in their partnership. She felt that her 32nd place in her first ever Verden Championship gave her a great taste at the young horse experience. "I enjoyed it thoroughly and found many aspects quite interesting," says Hayley. "Although having only ridden Rebana-W a short while I find her a very, very good horse for the future with high potential for piaffe and passage. However, she is still growing and sometimes cannot control her body completely." Aware and accepting of the fact that the mare wasn't the typical young horse candidate, Hayley felt that none the less the horse would have learnt a lot and will surely benefit from the experience. Hayley has spent the last seven years in Germany and she is currently training with Hermann Gossmeier. She enjoys her life in the heart of dressage. "Germany is, of course, quite different to home in Australia, but I love the intensity of the industry here," she confessed. Beresford feels inspired having all the top riders around her and likes to take a little bit of something from everyone. She hopes that her 2013 and beyond will see her keep on striving to be even better. "I just aim to keep on improving my team and see where it takes me!" Finishing 27th in the 6 year-old preliminary test, Jessica Greelish was very excited with her improved 8th place in the consolation final. She felt that her young mare Cavalia (by Sir Donnerhall I x Gribaldi) went super well. 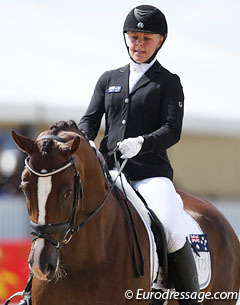 "Cavalia felt particularly super in the trot work and she was so brave," said Jessica. "The prize giving ceremony or as the steward called it 'the cat walk' was so much fun to be a part of!" Joining the other Aussies on the grounds in Verden, Jessica felt not so far away from home being able to hang out with all her fun team mates and all the other Aussies that made it over for the event. "I haven't been back to Australia since I left two years ago. Man time flies!" Her first go at the World Young Horse Championships, Jessica certainly hopes this won't be the last time she enters on a young talent. She loved every part of the experience, particurlarly the all-important preparation. "I trained with Andreas Helgstrand everyday in the lead up to Verden and I was also lucky enough to be able to compete at Falsterbo in the 6 year-old championship before Verden. I learnt so much from that show, as it is a really interesting test and really gets your horse working." Jessica's Cavalia is known around the stable as "the cat" for her confidence and lightfootedness. "She is such an interesting mix of a sharp and hot attitude to work but then she is also so brave, she is a great competitor! I love riding her and am so glad Andreas found her for me!" Moving to train at Helgstrand Dressage in Denmark with Andreas Helgstrand in August 2011, Jessica has learnt so much from the Danish Olympian, as well as many of the other talented riders at Helgstrand. "It's a lovely stable to be a part of. Everyone is so supportive, helpful and friendly," she explained. Greelish daily soaks up the atmosphere in the barn and is motivated by Andreas' talent and patience. Jessica says he always seems to make his tests look so easy and she hopes to one-day acheive her international dressage dreams with the same finesse. "The first time I saw Andreas ride in person was at the 2006 World Equestrian Games on Matine," Greelish reminisced. "Wow, was that an impressive horse. It was such an amazing feeling being part of a crowd, so excited by what we were all watching, that we all started clapping in time to the music before the test had even ended. They were such an inspiring combination to watch! Matine looked like she gave the passage everything she had. What a super horse." Still challenged by a slight language barrier Jessica feels that Denmark is a lovely country to train in, especially during the summer with its cute beaches, forests and quaint cities. "I live just outside of Aalborg and I've met so many lovely people in Denmark. It's fun catching up with them all at the shows! Being an Aussie can be tricky at times, particularly finding the correct information as sometimes there is a language barrier but for the most part it is no problem. I'm always impressed by the quality of horses and riders in Europe and I am always being inspired to work harder at becoming more professional in my riding."